A bowl of tomatoes on the kitchen counter might inspire a meal or a still life photograph. Tomatoes inspired New York photographer Miachel Breton to plunge into recreating favorite emojis with food. In her Food Emoji series, she has created and photographed six emojis crafted out of fruits and vegetables. Breton’s first Food Emoji composition occurred in August for the Photo District News contest. She was drawn to the idea of creating an emoji out of a food she loved. “I was working on a deadline and had only a day to do it and worked all night finishing it.” What started as an entry into a contest gained momentum as a conduit to promote simple beautiful foods in their natural state with emojis as the muse. As a child, Breton watched cartoons and told her mom she wanted to be an illustrator. She drew and took art classes throughout school. During college, she studied to become an art director and designer, for which she was employed in New York after graduating. She found the people and work great, but craved more, and taught herself photography in the evenings and created a food blog. Shooting often honed her skills. “I love seeing the beauty in the world and photography is the way to share it with people. When I picked up a camera, it felt right.” She now shoots food for websites, social media and editorial outlets. To decipher which emojis would make it to the canvas, she enlisted suggestions from friends and family of their favorites via social media. 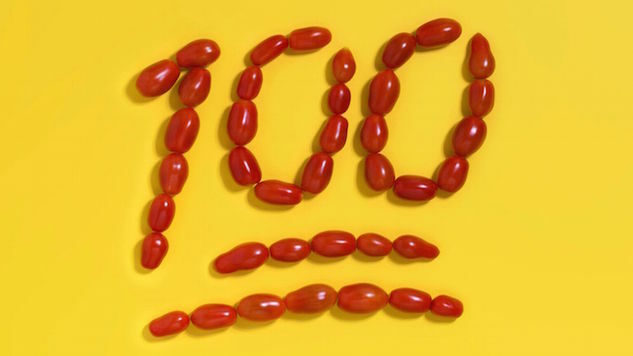 The 100 emoji made of locally-sourced cherry tomatoes set the others in motion, as the all-nighter creation for the PDN Contest. She followed it with the popular pile of poo emoji. Rather than crafting food emojis out of food, she opted to focus on more conceptual ones to recreate. She knew she wanted to do a hand emoji and in the end, selected the “praying hands” as an iconic image to show off the ingredients. Then came the fire emoji, sparked by a discovery of tiny peppers at the farmer’s market. “The fire emoji was easy because I thought peppers are hot! Plus, it felt great to also support the farmer in buying two pounds of peppers.” She composed the sparkles emoji finding that using tiny and consistently shaped ingredients like split peas helped form a cohesive picture in the mind’s eye. Each photo takes several hours to make, including set-up and lighting. She free-hands working ingredients into the emoji shape, a process Breton describes as meditative. Primary color backgrounds heighten the emojis’ cartoonish quality. Her aesthetic of light, bright, saturated images is evident in her Food Emoji series. “Through photography and styling, people want something that’s a little more real. With my food styling, I don’t Photoshop everything. If a tomato has a speck in it, that’s what food looks like.” And sure enough, in the eyes emoji image, some of the beans have tiny freckles. Upon close examination, some of the ingredients exert their independence while appearing from a distance whole and unified. In 1999, Shigeta Kurita, the father of the Japanese emoji, created emojis or “picture character” for the NTT Docomo i-mode, the world’s first mobile internet system. They caught on like wildfire in Japan. Designers in the U.S. adapted them for operating systems including Willem Van Lancker, a designer who crafted hundreds for Apple ios during his tenure along with designers at Google, Microsoft, Twitter and Facebook. Apple first introduced the emoji keyboard to their ios in 2011, igniting the explosion of emoji use in the United States. Mouth Spirit Gallery in Dumbo is exhibiting her Food Emojis from December 2, 2016 to January 31, 2017. Prints are also available on her website. Annelies Zijderveld’s first cookbook, Steeped: Recipes Infused with Tea, is available now. She has been published in Curator magazine, Arthouse America, and Sated Magazine.